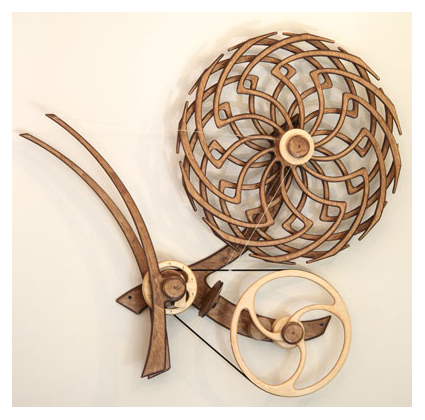 Shimmer is the second sculpture I've created using this patterning wheel. I created the first, Radiance, in 2007. At the time I designed Radiance I was torn between two different ways to control the motion of the wheels. One mechanism allowed each wheel to move independently, creating random patterns as the wheels sped up and slowed down at their own pace. An alternative mechanism synchronized the motion of the wheels so they always move at the same pace but in opposite directions. Radiance was the result of the random design mechanism. When given a choice I like to take the random road! I finished the edition of Radiance last year. It was a very popular sculpture and I kept getting calls from people looking for one. That got me thinking about the alternative design again. I decided to finish the design and make a test piece. The result is Shimmer. This is a virtually silent, long running sculpture. The motion starts very slowly, smoothly accelerates, reaches a peak, and then smoothly decelerates, comes to rest, reverses direction and repeats the cycle but with the wheels going in the opposite direction. This creates two distinct patterns, one with the center of the wheel appearing to grow and one with the center appearing to shrink. I still can't decide between the two sculptures. I like the relaxing feel, silence, and dramatic patterns of Shimmer but I'm still drawn to the energy and randomness of the Radiance. In the realm of problems this is a nice one to have! • "I purchased "Shimmer" along with "Quandary" at the same time. While I absolutely love the sophisticated and stylishly aloof 4-piece movement of Quandary, Shimmer appeals to me in a different way because I get to enjoy two totally separate movements at the same time - the "shear-like" movement as well as the circular whirlpool movement. I'm glad Marji convinced me to get both because I could not decide! As both a part-time artist and an engineering buff - your work David, is pure genius!" 4.30.11 - J.K.
David: Oh to have more time in the day! I have found so much to explore in the world of motion that I have needed to limit the variables. I continue to work with the same type of wood and stain combinations so as to concentrate on the subtleties of the motion.